After 20 minutes, the game shouldn’t have been as close as the scoreboard. Victor Ejdsell made his NHL debut, starting the game between Patrick Kane and Brandon Saad. Marcus Sorensen scored his fifth of the season for San Jose nine minutes into the game but the Hawks dominated the rest of the period. At 15:32 Alex DeBrincat tied the game. It was the 26th time DeBrincat has found the back of the net during his rookie season. Saad and Vinnie Hinostroza picked up the assists. Birthday boy Connor Murphy then gave the Hawks the lead 1:18 later. Chicago held an 11-10 shot advantage and 2-1 lead after 20 minutes but the Hawks carried the play for much of the first. Ejdsell looked good and his size was obvious early. The Sharks looked more like a playoff team in the second. San Jose out-shot the Hawks 15-10 in the second and Evandar Kane scored an ugly goal to tie the game at 16:39. The puck got through Anton Forsberg and there’s no way an NHL goaltender should give that goal up at that point in the game. Forsberg played fairly well for most of the opening 40 minutes, but the Kane goal was bad. Fifteen minutes into the third, Murphy took himself out of position to deliver a big hit and it cost his team. Tomas Hertl scored his 21st of the season to give San Jose a 3-2 lead with 4:19 left in regulation. And less than two minutes later, Patrick Sharp tied the game at three. DeBrincat and Erik Gustafsson were credited with assists on the goal and we headed to overtime. The Sharks out-shot the Hawks 33-29 in regulation. In the final two minutes, Kane and Nick Schmaltz had a terrific shift but weren’t able to capitalize thanks to a huge save by Martin Jones. Neither team scored despite good looks from both sides and the game was decided in a skills competition. Jonathan Toews was a scratch for the game, taking away one of coach Joel Quenneville’s first two shooters. Patrick Kane was up first for Chicago but was stopped. Logan Couture was first for San Jose and easily scored. 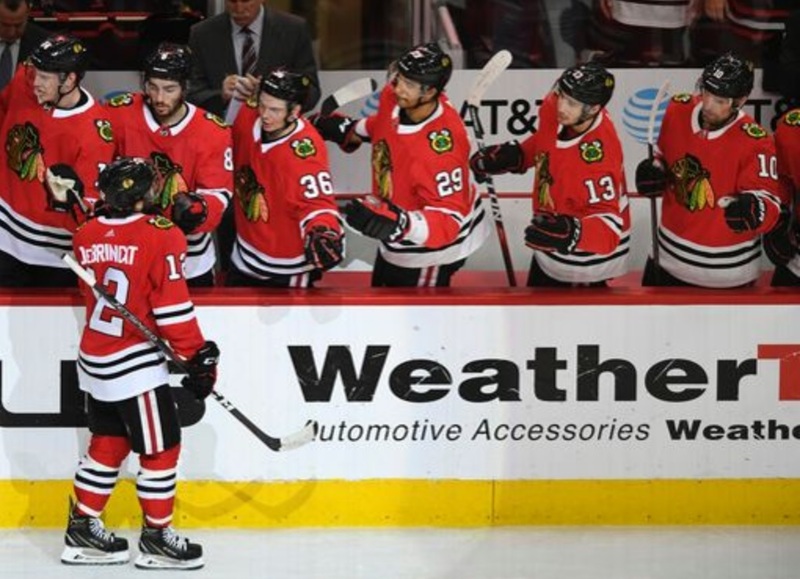 DeBrincat shot second for the Hawks and tried to go five-hole unsuccessfully. Joe Pavelski came over the boards and was stopped. Patrick Sharp beat Jones to keep the shootout alive. Chris Tierney was then stopped by Forsberg and the shootout went to sudden death. Schmaltz shot fourth for Chicago and got nothing. Kevin Lebanc then won it for San Jose. For his debut, Ejdsell skated 17:25 with two hits and three shots on net. He was minus-three in the game, however, while winning six of 11 faceoffs. Chicago is expected to welcome another new face to the lineup on Thursday when Dylan Sikura should be available to make his NHL debut. A game that wasn’t hard to watch, real fun ot. Kane and Schmaltz something special in ot, both goalies outstanding. Forsberg tough luck on the breakaway goal but solid otherwise, see his anger after shootout winner. Ejdsell looked good with Kane and Saad, hope he stays for last 5 games to watch him, nice net presence, good on faceoffs. Murphy blocking shots and laying the body, caught on one hit but Eric i would be a good dman if i didn’t have to play defence Gustafsson kinda dropped the ball on that play and let it happen. Bring on Sikura Thursday. I was pleasantly surprised by Ejdsell. The few shifts I saw him play on TV a couple days his skating looked like Jimmy Hayes and I thought he’s not going to be an NHL player. He’s certainly not fleet of foot but his skating isn’t nearly as bad as I thought it would be. He finished a -3 but I thought he played very well with the exception of not tying up the Sorenson’s stick on the Shark’s first goal. He had poise, passed well, good vision, goes to the net, has a nice quick shot. All in all a pretty nice debut. Nice to see the Cat tie up Kane for goal scoring lead and I thought he should have gotten an assist on Murphy’s goal for a 3-point night. Forsberg took the loss but played pretty well for the second game in a row. Props to him. Now that we have 2 new players, we need new hockey nicknames. I could the “the edge” or maybe edgy for Ejdsell. But what about for Sikura … what are you gonna do with that? Nick Schmaltz and Kane are magic together! He is the perfect centre for Kane so let’s start next season with that duo for 82 games COACH. Toews is a second line centre is does not fit Kane style anymore because he simply cannot keep up. If BOWAN wants to really dream and save his job, then he should do everything to sign EVANDER KANE next season. Can you imagine E Kane – Schmaltz- P. Kane, together? For 82 games!!! The drop off after Kane and Schmaltz in high end talent on this team is big. If #8 would have stayed with Kane all season at centre, he would have racked up bigger numbers. Remember the game in Vancouver when Caoch Q benched SAAD and then brought back AA, first on the wing then at centre? After that loss and after he removed Schmaltz from Kane, the HAWKS took a nose dive and so did Kane. And by the way, Edjsell? -3? Really, let’s get serious. He is slower than Anisimov. Once again, another Bowman HYPE special, bringing him up to play with Kane and SAAD??? Why? Leave in Rockford! Joke…. Should have been Nick Schmaltz at centre all game with Kane and Saad. Vinny can play centre so call up Iacopelli , Fortin or Graham Knott to play left wing. And where is Duclair?At least he can skate and if Coach Q can finally give up on the DOG HOUSE routine, and start coaching a guy like Duclair, maybe he can turn out to be a solid NHLer. Duclair has skill, speed, and some size. Teaching is part of coaching these days. Benching does not work. I guess the more points #8 gets, the more Bowman needs to negotiate salary with his agent. Agree that Edjsell’s skating was better than expected. He must be in a bit of a fog traveling from Sweden less than a week ago, 2 games in Rock and then up to the UC. I love Schmaltz and think his growth this year has been terrific but I can’t handle more of these 2 on 1’s where he won’t fire a shot. I was half expecting him to look for a pass on his shootout attempt. The Hawks will need a lot of things to go right next season to get back to being a contender. Crawford returning and playing 60+ games at the level we’re used to seeing is the first thing that needs to go right. I would argue the next most important thing is Toews getting back to playing like a 1st line center rather than what we’ve seen from him the last couple seasons. Championship contending teams have at least one top centerman and for as fast and exciting as Schmaltz can be – he’s not a #1 NHL center, at least not yet. For all the complaining about Toews, he is still outscoring Schmaltz by a few points and he does some other things better than Schmaltz too. So before we anoint Schmaltz as an elite player in the same category as Kane – he’s not there yet. Makita – Duclair is injured, Fortin hasn’t played in a while (either hurt or healthy scratch), Iacopelli has been up and down between Rockford and Indy and Knott is playing 4th line in Rockford. Mikita, are you just trying to stir the pot? You are, aren’t you? OK, I’m on to you now so I won’t bother with trying to have a serious discussion with you. Troll away to your hearts content. Schmaltz is a very good, growing player, but he isn’t as good as the current Toews, much less Toews at his best. This is just a ridiculous thing to say. Toews “kept up” with Kane just fine when they were put together recently, scoring more points than Kane did. Call 1st or 2nd line centre, Schmaltz and Kane have chemistry. Toews plays a grinding game which is fine but not Kane’s style. Toews has averaged between 55-65 points the last 4 years. Yes he brings a lot to the game but let’s be honest at 10.,5 million, he is not producing like the majority of 1st line centres in this league. All the pressure remains on Kane to produce and last year PANARIN and KANE carried the team along with HOSSA. Still believe Duclair has more upside than many players on the HAWKS. He simply needs to get an opportunity to be coached not benched. He has elite speed and thicker than Sikura or Vinny. Ebony, stirring the pot? No, talking hockey. “Denial” is just not a river in Egypt. A championship CUP team can have one, two or three late round picks on their roster like we had with Shaw and Brouwer at one point. But look at our cup teams, every top player ( would guess 15 out of 20 ) was a high draft pick between 1st and 3rd round. Ebony, you want to do some research. 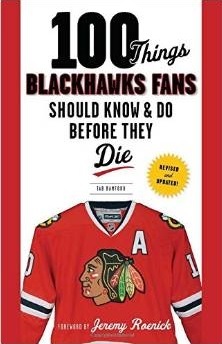 TOEWS KANE SHARP SEABROOK KEITH CRAWFORD LADD HOSSA CAMPBELL HAMMER LEDDY RICHARDS HANDZUS BOLLAND FROLIC KRUGER BICKELL EAGER VERMETTE TEUVO MADDEN …..so on and so on. Look at the CUP rosters? Have fun! Schmaltz isn’t a 1C or 2C at this point in time because he’s atrocious on face offs. He can’t win draws. That’s kind of a big part of playing center. Not sure if you’re aware of that lol. Arguably their best 5 players that year … but hey, Mikita says it ain’t so, so it must not be. Oh Oh the ‘CAPITALS’ are starting to creep back in…. I know he has some drop off stretches, but impressed that Debrincat has 26 goals and 48 points playing in the blender and mostly 3rd line, and even 4th. ‘Kane’ like vision and a better scorer and being recognized as defensively responsible–yes I know 88 a much more gifted star, but speaking of high end talent, 12 is another. I’m also impressed that at his size he’s basically played the last four years without time off-tough kid. Thanks Montreal. I wonder if we put all of our free agent $ into one basket could we lure Carlson here – then we might have a PP! I was really hoping Hawks could luck out and draft a Stud Forward… Zadina/Wahlstrom…. and they immediately make jump to NHL roster… Than Hawks actually looking pretty loaded. BUT- their D looks down right AWFUL!!! The Statue (Otherwise known as Seabrook) and Brain dead Gus… Murphy- opts for the Hit… cuz he really can’t skate either… those guys are all bottom pairings. So why is DCat on the 4th line (Jurco on 3rd?). Where is Hayden should hre not be up for the last few games? Some confusig lineups. Hino and DCat should be on same line. We haven’t seen Sikura on NHL ice yet. And we’ve only seen Victor Ejdsell for 17 minutes. So it’s hard to start throwing them onto lines next year and assume everything is fixed. If Ejdsell is getting a look at center why not try AA as top line winger. Trying Sikura in different top 6 combos and looking for chemistry in last 5 games is a good idea. See Highmore sent down, If Toews back try as top 9. Wall unless Blackhawks get a lottery pick Zadina is gone, there is a good chance Wahlstrom may still be there if they wanted him but be some promising defencemen there too. Tab, I like those lines. Toews/Schmaltz/Anisimov/Ejdsell is probably the best group of centers the Hawks can throw out there, providing Ejdsell proves he can play center in the NHL. If not Kampf is my 5th choice for center. I’d probably rather have Kampf in the line up over Highmore. Wahldtrom is committed to Harvard which probably means he won’t be available to play in the NHL for 3 or 4 years. Hopefully the Hawks don’t select him if he’s available because they don’t have the luxury to wait a few years for their high first round draft pick. Wahlstrom might be tempting though because they really have no number 1 center and that is as hard to find as a number one defenseman and just as important. But if there is any chance he goes to college and then doesn’t sign I would say stay away. This high pick will be our one shot at getting a stud dman or center. With a healthy Crow we are not ever picking this high in the draft. I hope they choose carefully and don’t rule anything out. I guess even a can’t miss winger would help. I believe in Q-speak “didn’t mind him” ranks below “liking” but ahead of “just okay” so maybe a C+ or B.
Wahltrom is listed as rightwinger in most scouting reports. Thank you Ian, my mistake. I looked at one that listed him as a center and ran with it. There don’t seem to be any stud centers but I don’t know about the Swede guy. 1. Trade Nashville’s 1st to Vancouver for Alex Edler ($5M through 2018/19). Throw in Rutta if Vancouver retains some of Edler’s Cap hit. He would be a 1-year stopgap veteran LD that can play top-4. 2. Select RD D-man Evan Bouchard – even if it means you may need to trade up a slot or two to get him. 3. Tell Seabrook to show up to camp a lot more leaner and meaner. Saying its not a centerman draft. Some saying not future a no. 1 center in this draft. I think the Swede your talking about is the one labelled the Swedish Patrice Burgeron, but debateable how high his upside is and not alot of offense. OK so we are back to top notch D prospect with some warts most likely where we pick or stud winger. Can’t go wrong either way cuz we need both. It will be interesting to see where we end up in the draft. I have read that they do not anticipate any goalies going in the top 40 picks, as this is not a good goalie draft. The only goalie i have anything about is Alexis Gravel from Q league. Say ge gas potential and be a solid mid 2nd rd. pick. But without one maybe Bowman be lucky and he is still around early 3rd. Notre Dame goalie Cale Morris looks good, he is an undrafted free agent probably looking to sign after Frozen Four. He is small for an NHL goalie so might be an issue, also played on a strong defensive team so may look better due to that. I wonder if Rutta plus Nsh’s 1st would bring back Doug Hamilton? maybe throw in Duclair and get a prospect or draft choice back.